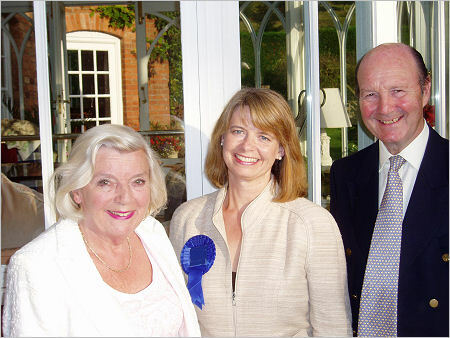 Seventy members of the Tenbury and Teme Valley branches of the Conservative Party met the new Parliamentary Candidate for West Worcestershire, Harriett Baldwin, at a drinks party on Saturday night, 9th September in Eastham. Harriett was greeted by Michael Opperman, Chairman of the Teme Valley branch, who said she was contemplating a serious drop in income in giving up her career as a currency manager in London to fight to hold the seat for the Conservatives, once Sir Michael Spicer stands down at the next General Election. As a demonstration of her commitment to the area, Harriett had earlier that day moved into her new house in Shelsley Beauchamp and from January her son will attend a local school. In thanking the group for their welcome on a warm still evening, she said how much she was looking forward to getting to know this beautiful part of the country. While the Labour Party seemed to be involved in a period of self destruction, she would be concerning herself more with local issues, as the fight in West Worcestershire was against the Liberal Democrats. Such matters as opposition to the closure of public toilets in Tenbury, Malvern and Upton, where she had joined a rally the previous weekend, would demonstrate how a Conservative administration would run Malvern Hills District Council, if it was successful in the elections next May. The vote of thanks to Harriett was given by the co-host, Mrs Ann Balmer, the Chairman of the Tenbury branch of the Conservative Party. Proposed boundary changes mean that the Tenbury Wells and Teme Valley areas will leave Leominster and become part of the West Worcestershire constituency at the next General Election and the associations are reorganising now to reflect this. Photo: Harriett Baldwin, Parliamentary Candidate for West Worcestershire, with Ann Balmer, Chairman of the Tenbury branch and Michael Opperman, chairman of the Teme Valley branch at a drinks party on behalf of the Conservative Party in Eastham on Saturday night, the 9th September.